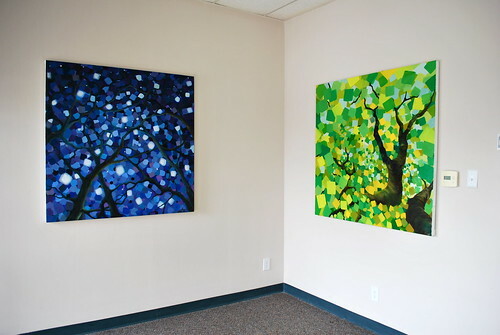 My two latest paintings, hanging on the wall of my gallery. The blue, night-sky one is called “Starshine Before the Dawn”, and was inspired by very early mornings/late nights, depending on your approach. The mysteries of the stars framed by the branches reaching up from Earth. “Green Square” pushes it’s leaves towards you, the viewer, as the wind starts to blow the leaves off the trees, riotously. If you would like to see them in person, visit my gallery at 3810 W. Northwest Highway, Dallas, Texas. Google search on “Jardine Studio Gallery” for a map. Come on the 23rd of October 2009, and enjoy art with wine and appetizers! Next post: October 23rd, 2009. Launch Party!